I have been saving these for a long time. Some of these were unintended results of other unrelated projects. Now that I have enough of them I have posted them. Note: Please wait for the animations to load. It will take about a minute on a moderately fast internet connection. It appears as though the lines are being eaten by the two halves of the stationary vertical line. This is a famous illusion you might already be familiar with. The alternating rows of the squares are shifted to the left and right and because of this, the lines appear as if they are not parallel even though they are. 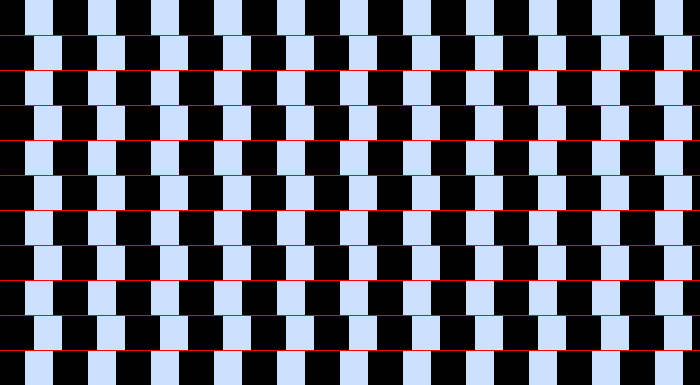 As soon as the squares move, it appears as though the lines stop being parallel. Cool. Great! Looks like you will give tought competion to Nolan. Graphs (Graphics) are great. I don’t know that but the sliding squares one is not completely my idea. I saw it on buildings. I decided to make it dynamic.